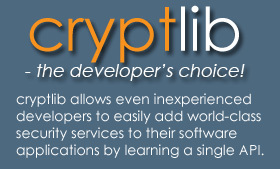 cryptlib supports the PGP/OpenPGP message format alongside the PKCS #7/CMS/SMIME formats, allowing it to be used to send and receive PGP-encrypted email and data. As with the S/MIME implementation, the PGP implementation uses cryptlib’s enveloping interface to allow simple, rapid integration of strong encryption and authentication capabilities into existing email agents and messaging software. Since the enveloping interface is universal, the process involved in creating PGP and S/MIME messages is identical except for the envelope format specifier, allowing a one-off development effort to handle any secure message format.